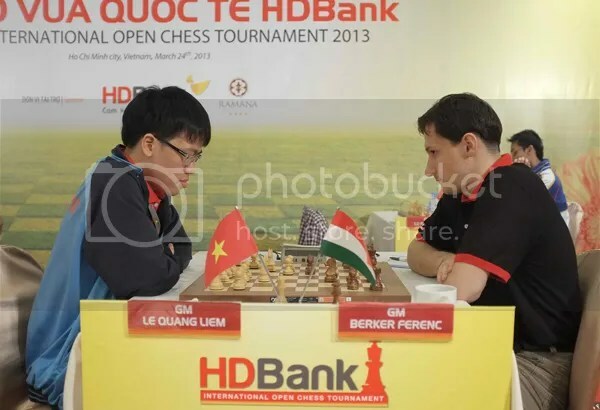 The 3rd HDBank Cup International Open Chess Tournament that was held on 19-24 March 2013 in Ho Chi Minh City, Vietnam was won by the #1 seed Hyper GM Le Quang Liem (VIE)2709 when his final round (R9) game against the #2 seed Hyper GM Berkes Ferenc (HUN)2702 was drawn after the 31st move. 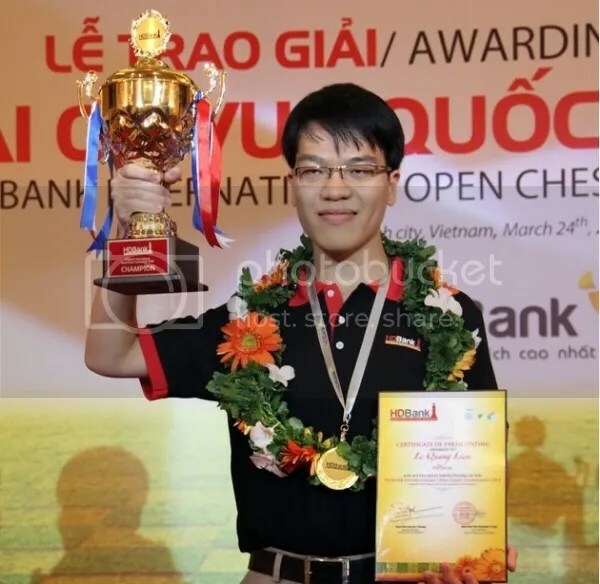 Le Quang Liem, who only needs a draw in the last round to claim the title, scored 7.5/9 (6Wins-3Draws-NoLoss) with a Rating-performance(Rp) of 2779 and a +7.8 in FIDE rating points. 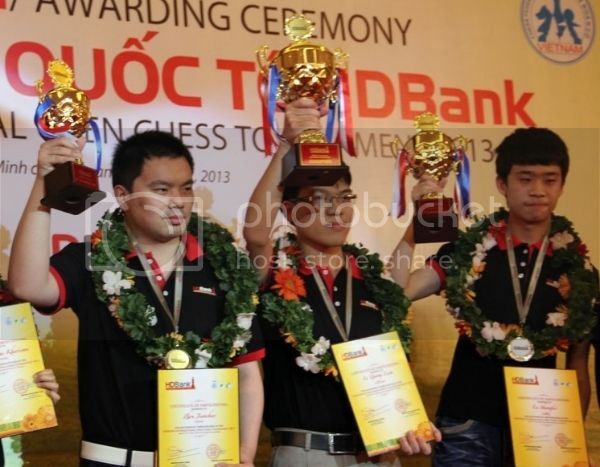 This bring his Standard ‘Live Rating’ to 2716.8 or 2717 FIDE rating come April 2013 publication. This will equal his Standard ‘Peak Rating’ of 2717 which he previously registered in September 2011. 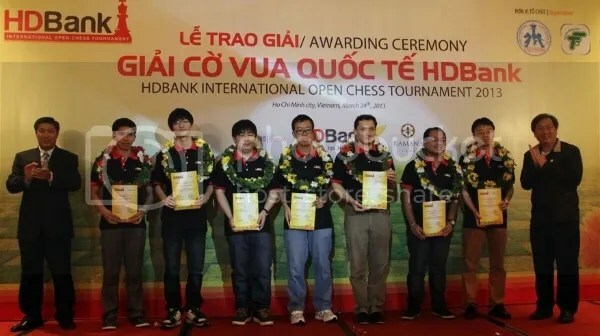 Le, took home the top prize of 10,000 USD and the Champion’s trophy. 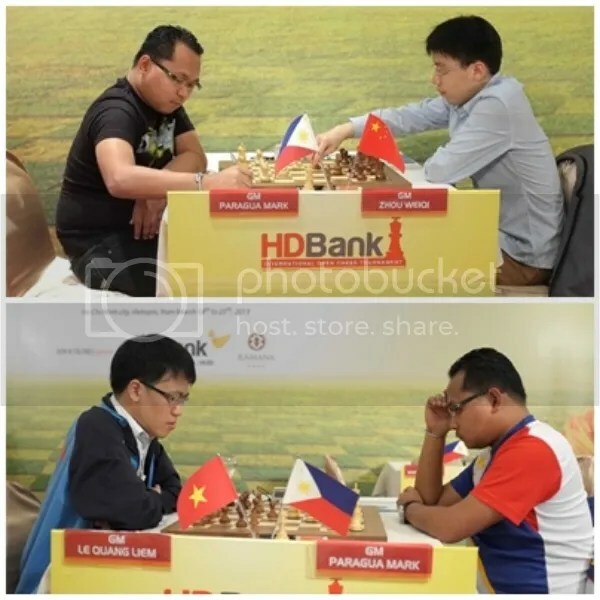 The 17-year-old and #11 seed GM Lu Shanglei (CHN)2552, who was with the 7-man group of 6-pointers after the penultimate round(R8) was the sole winner in R9 among the seven and finished at 2nd place scoring 7.0/9 (5Wins-4Draws-NoLoss) and took home the 1st runner-up trophy plus the 5,000 USD. 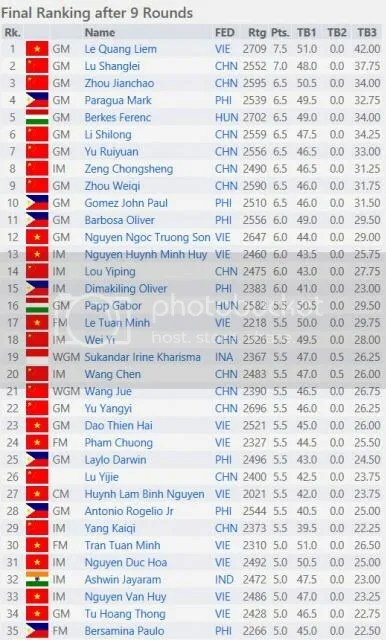 Lu, ousted GM Barbosa Oliver (PHI)2556 who was also gunning for 2nd place finish. Barbosa resigned after Lu’s 37th move and was relegated to 11th place overall scoring 6.0/9. Finishing 3rd to 10th place is an 8-man group of 6.5/9 pointers. 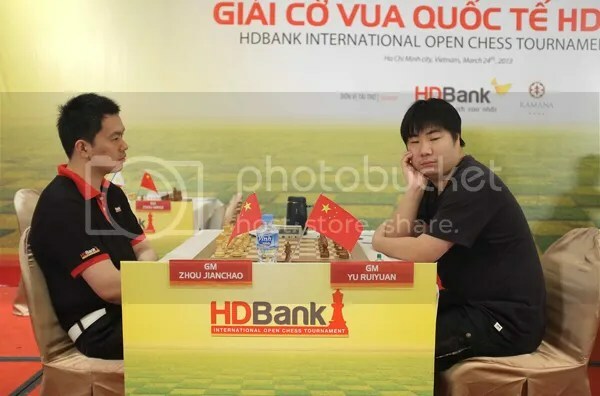 The #5 seed GM Zhou Jianchao (CHN)2595 with the highest Buchholz tiebreak points finished 3rd place overall plus the 2nd runner-up trophy. 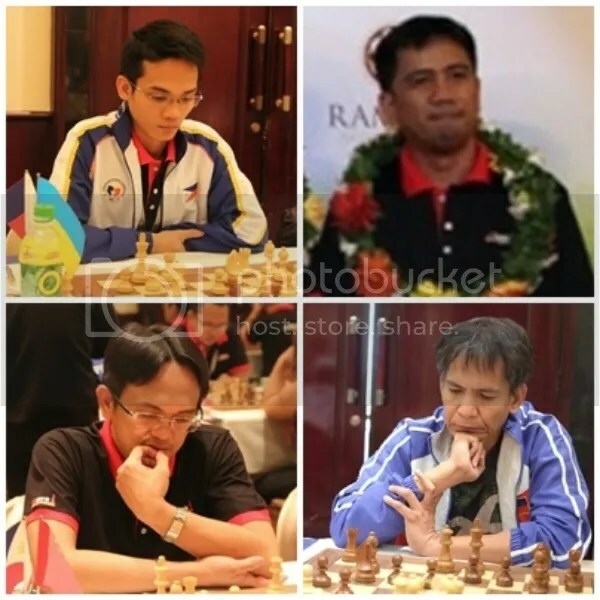 The top finisher for the Philippines was the #13 seed GM Paragua Mark (PHI)2539 who finished 4th place overall scoring 6.5/9 (5Wins-3Draws-1Loss). 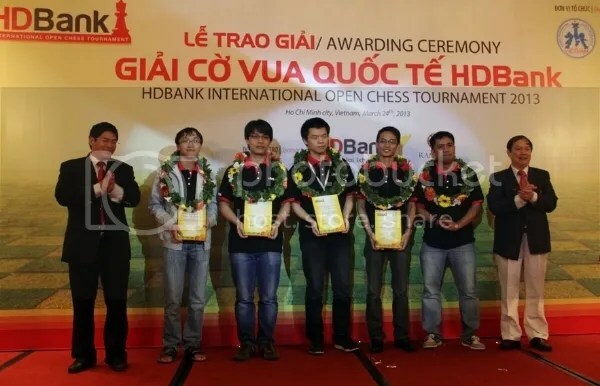 He absorbed his lone loss to the eventual tournament’s champion Le Quang Liem in R6. 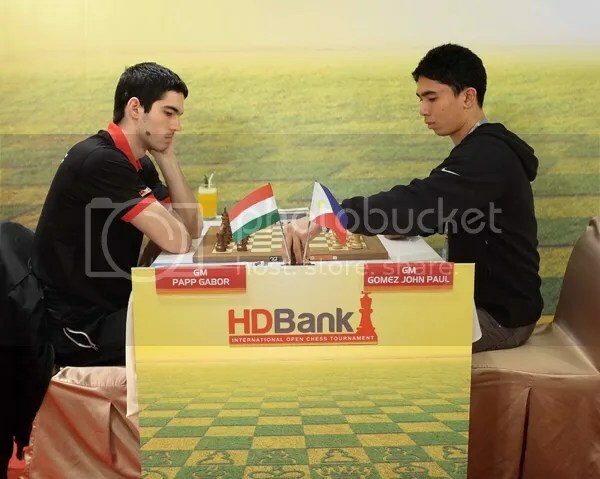 Paragua’s Rp was 2647 and had gained a +13.5 FIDE rating points. The #16 seed GM Gomez John Paul (PHI)2510 who also scored 6.5/9(5Wins-3Draws-1Loss) came in at 10th place overall. The event, a Swiss System of 9 rounds ‘Standard Chess’, was participated by 105 players from 13 Federations/Countries. 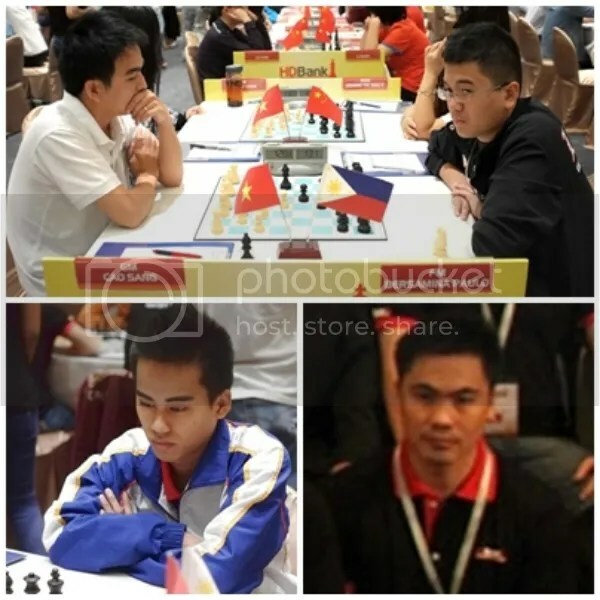 There were 71 titled players [20-GM, 19-IM, 4-WGM, 9-WIM, 13-FM, 3-FM & 3-CM).